Today in Masonic History Polydore de Keyser passes away in 1898. Polydore de Keyser was a Belgian-born English politician. De Keyser was born on December 13th, 1832 in Dendermonde, Belgium. Sometime before 1849, De Keyser immigrated to England. By 1853, he was a naturalized citizen. After becoming a citizen he founded the Royal Hotel, a 400 room built on the site of Bridewell Palace, a residence built for Henry VIII. From 1856 to 1887, De Keyser ran the hotel himself. The hotel was popular with foreigners visiting London, which is what kept the hotel going. It probably helped that De Keyser spoke 6 languages himself. The Hotel was also popular with City Companies holding their banquets. In 1929, just over 30 years after De Keyser's passing, the hotel was torn down. De Keyser belonged to several City Companies, which were trade guilds for various industries. The guilds included, Spectacle Makers, Farriers, Butchers, Inn holders, Poulterers, Gold and Silver Wire Drawers. De Keyser was also a governor of three area hospitals. They were Bridewell, Bethlehem and St. Bartholomew's. De Keyser served as the Sheriff of London and Middlesex. He was also elected as an alderman representing Farringdon Without on the Court of Common Council. 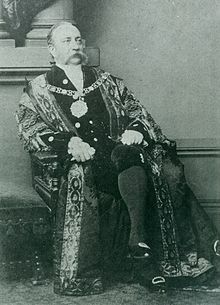 From October 1887 to November of 1888, De Keyser served as Lord Mayor of London. He was the first Roman Catholic to hold that office since the reformation. Notably, the last few months of De Keyser's term in office was marked by the infamous Jack the Ripper murders. From September of 1888 to November of 1888, what is termed the five canonical murders, took place. There were other murders that occurred after De Keyser left office, although the other 6 murders, totaling 11, were never proven to be linked to the original five. De Keyser passed away on January 14th, 1898. De Keyser was a member of MacDonald Lodge No. 1216 in London, England.